Pokemon Go is celebrating Easter with the upcoming Eggstravaganza event next week, and you can get in on the fun. Pokemon Go is bringing back its special Easter-themed event next week, so get ready to jump on board, trainers! The Pokemon Go Eggstravaganza event is coming back to the game on April 16. Players can participate in the third annual adventure on this day throughout April 23, so make sure you've got your Incubators at the ready. When venturing out into the world, you'll need to turn on Adventure Sync, and you'll find different Pokemon hatching from various types of eggs. If you're really lucky, you may even happen upon a Shiny Buneary to get you in the mood for the holiday. There's a wide variety of different Pokemon you can get from eggs, too, like Bulbasaur, Charmander, and Squirtle, and various other "cooler" Pokemon (read: rarer) like Swablu, Luvdisc, Kricketot, and a whole lot of other 'mons that you can add to your collection. For the event, Pokemon like Pichu, Smoochum, and Magby will be available to cop in 2 km Eggs, and Egg-focused Field Research will be available to complete for rewards. The focus for the event is hatching eggs, after all, so every one that you hatch will net you bonus Candy. Lucky Eggs will last twice as long, and you can count on Incubators to be effective for twice as long as well. 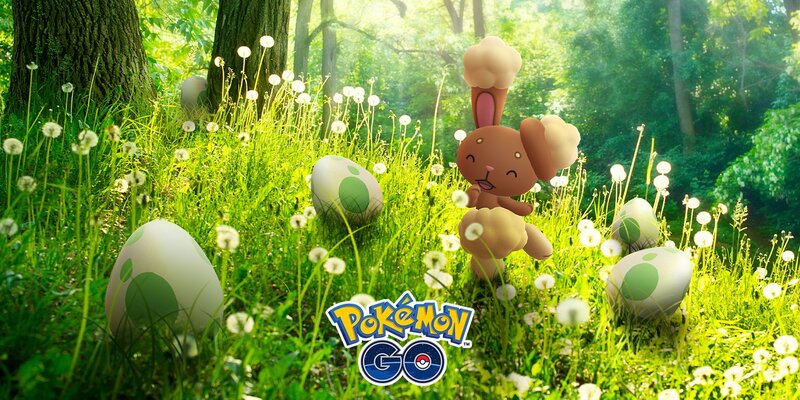 If you're planning on going to what essentially amounts to an Easter egg hunt in Pokemon Go, make sure you get out there and get started next week, because it'll only be available for a few days.